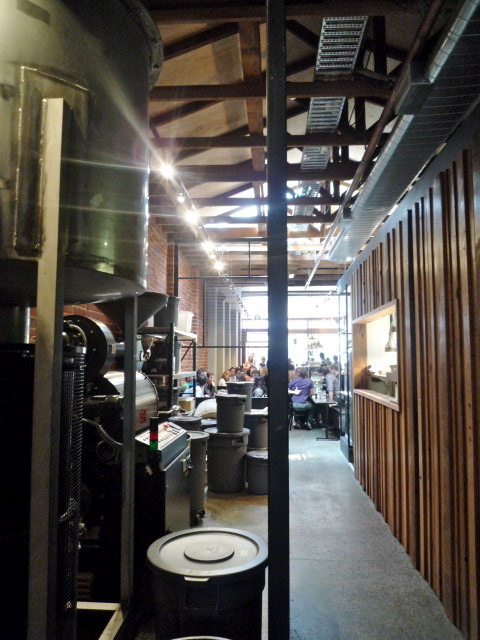 In the space of two weeks I visited two separate and equally coffee-focused cafes south of the Yarra. These are their stories. CHUNG CHUNG! When I recently tried out the new Outpost by St Ali Aaron suggested I also check out Crue, located only a stone's throw away on Toorak Road. 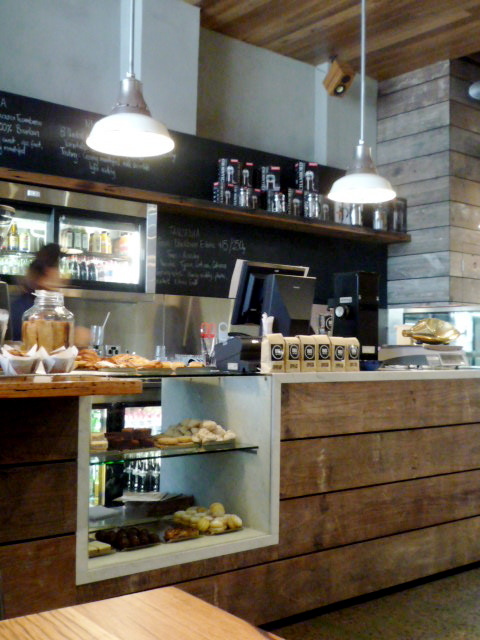 Crue has been operating since about the start of the year and is also very much a coffee-focussed cafe where food plays second fiddle. 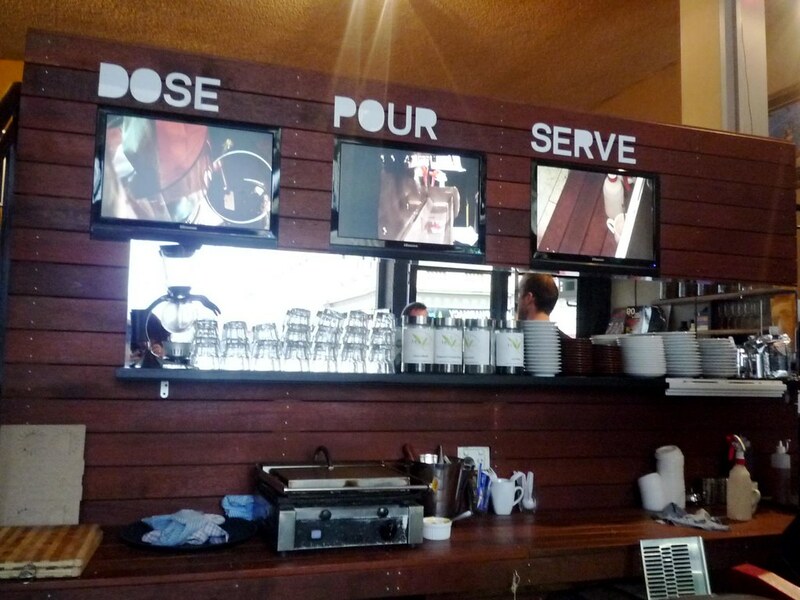 Coffee fetishists can enjoy watching their coffee (one of the many single or mixed origins on offer) being ground, poured and served via the live video camera feeds on the screens behind the counter. When I went in with Mum and Dad, we had coffees made from beans a customer had brought over from London coffee house Flat White. 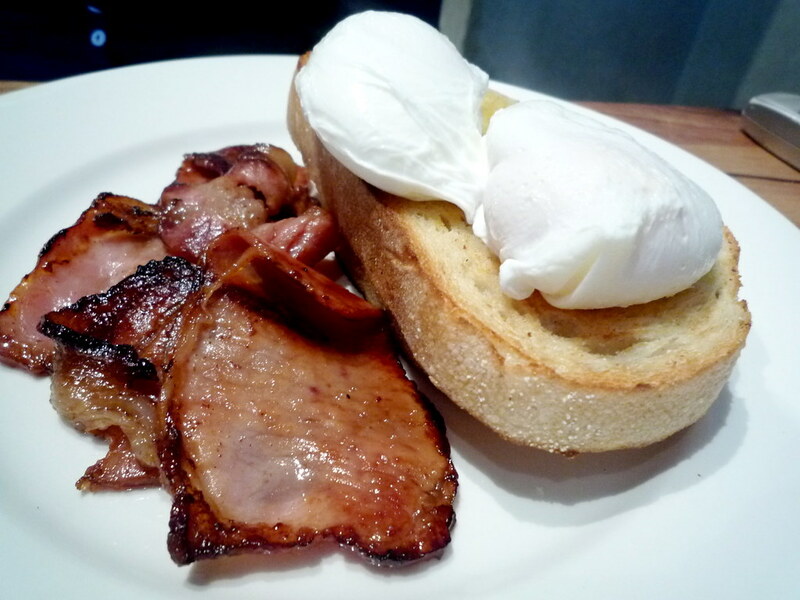 While the food may play second fiddle to the coffee, we were all very taken with our brunches. 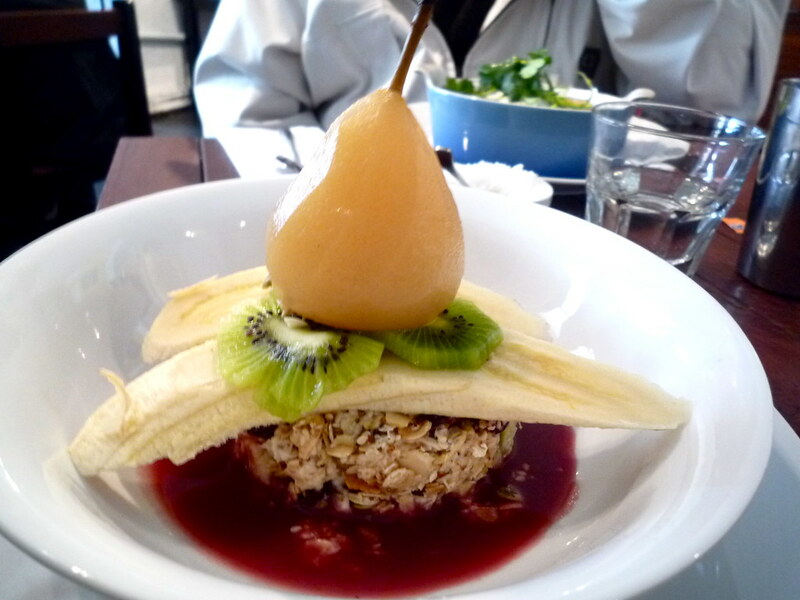 Mum loved the taste (and the presentation) of the bircher muesli with poached pear, banana, kiwi fruit and antioxidant juice ($10). 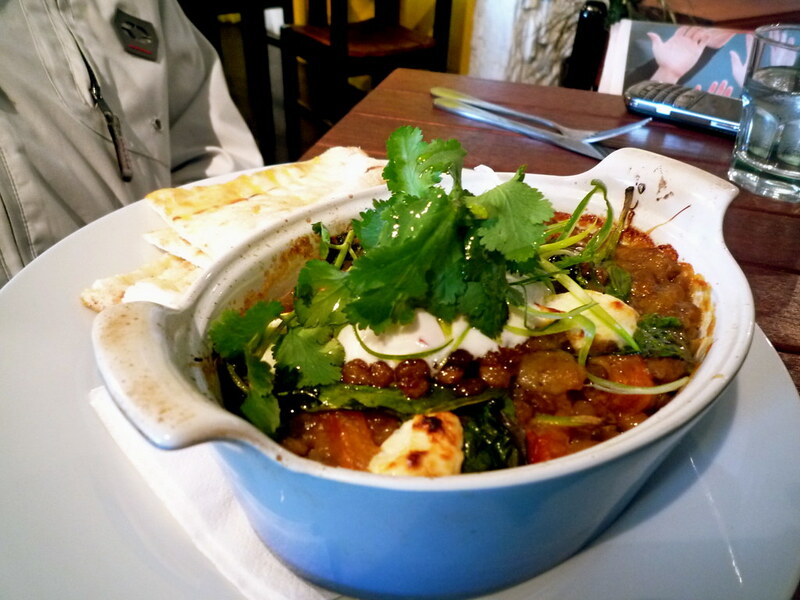 Dad attacked the huge serve of baked eggs with masala spiced du Puy lentils, spinach and scented raita ($14). 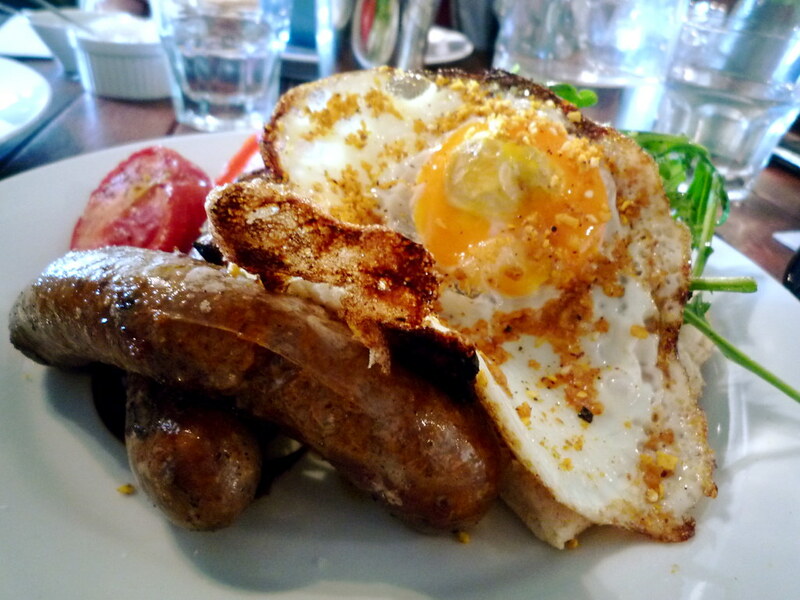 My order was a perfect hangover cure: dukkah spiced fried eggs with organic Merguez sausages, rocket, flat bread and roasted tomatoes ($14.50). Both dishes packed plenty of punch. There were two other details about Crue that I loved. 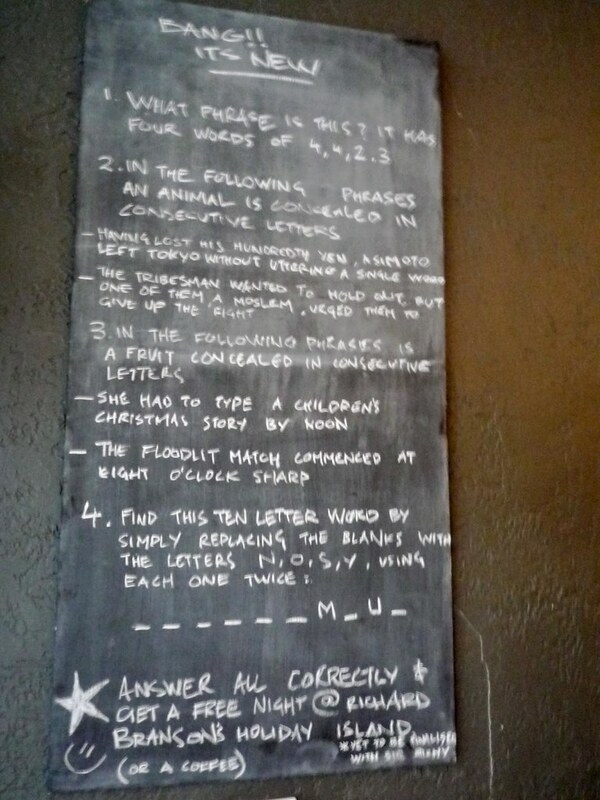 One was the blackboard of brainteasers, which is updated weekly. 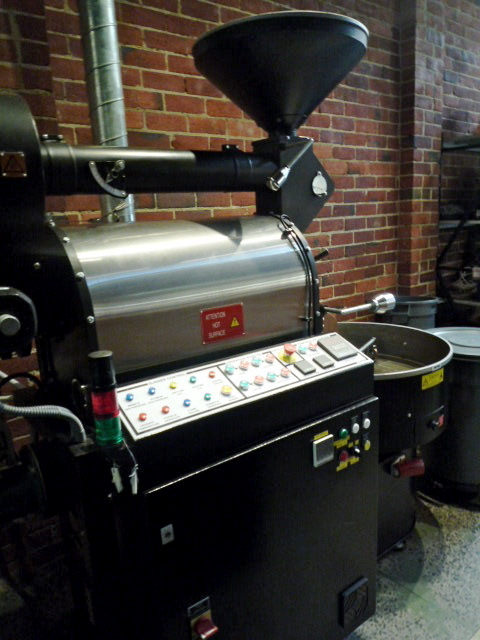 Answer all the questions correctly and get a free coffee. Last Sunday I was meeting the divine Miss S for brunch (before she jets back overseas to continue her showbiz career). I suggested we try Dukes, which had been recommended to me by Jack. Dukes is in Windsor, just a few doors down from Borsch Vodka & Tears, so I strolled down from Richmond in the sunshine. 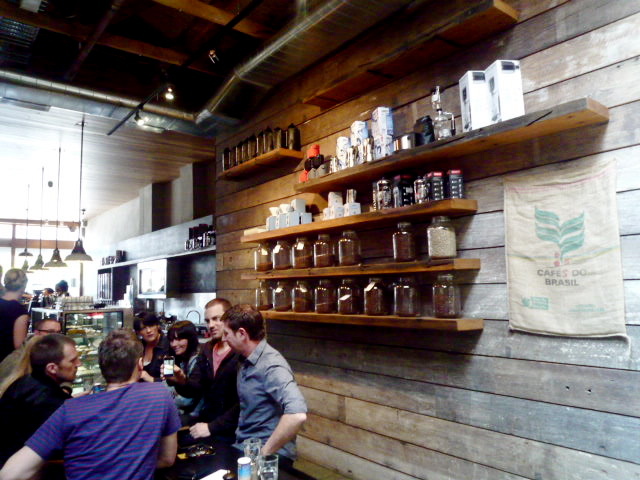 As you can see from the photos, the Dukes roaster is right there in the back of the cafe, and coffee paraphernalia abounds. 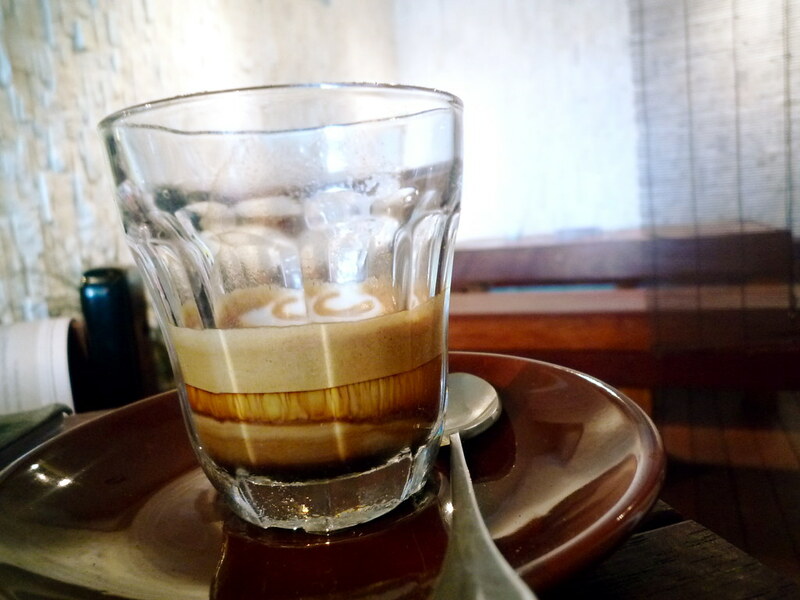 I wanted to have a siphon* coffee, but the blondie serving us said they couldn't oblige so I settled for a latte instead. 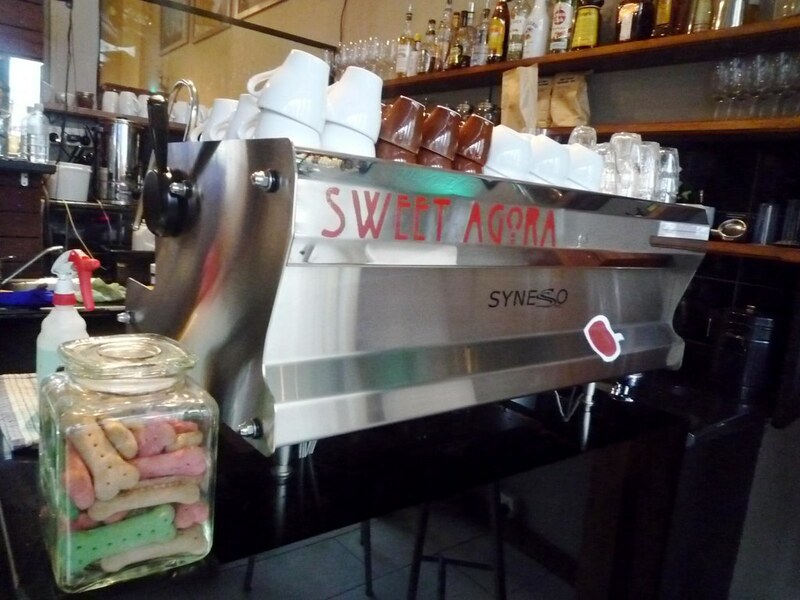 * Can a nice coffee geek explain to me whether I should be spelling it siphon or syphon? I've seen both spellings used more or less interchangeably online - is there a distinction? Or a stylistic preference? 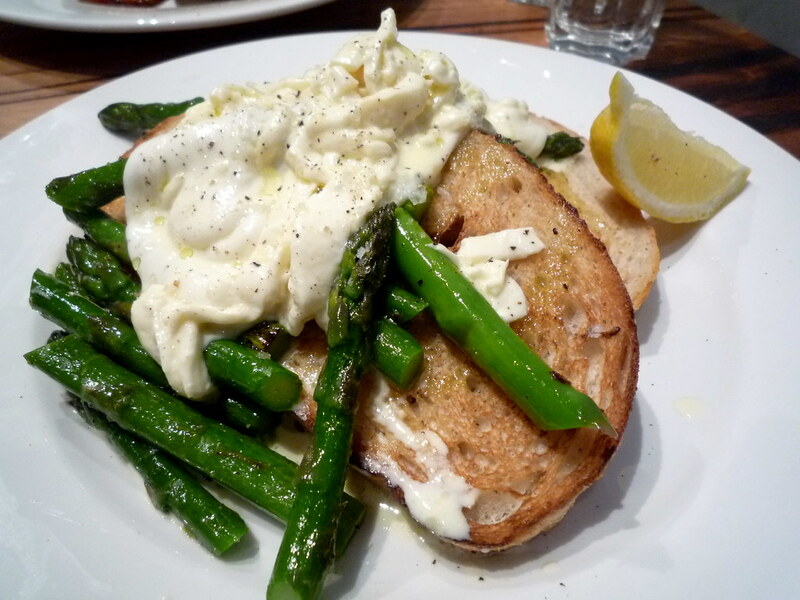 I wasn't in the mood for eggs, so on the strength of Jack's recommendation I ordered the burrata on ciabatta toast with asparagus ($15). So glad I did! The fresh, vividly-green asparagus (don't you just love springtime?) tasted fabulous with the creamy, mozzarella-ey cheese and a squeeze of lemon. A great brunch dish. When we visited, Dukes was PACKED. Blondie waitress apologised when she took our order, saying the kitchen was a little behind and that there may be a wait of about twenty minutes for our food. I appreciated that she told us upfront, and we weren;t bothered by the subsequent wait - it's all about managing expectations, eh? The most popular syphon coffee makers are made by Hario, and they spell it with the y. The product is called "Hario TCA-2 Syphon". Hello Anonymous, the "blondie" reference was meant purely in an affectionate way (Blondie was a nickname my mother called me when I was little that I loved - she still calls me Blondie sometimes, albeit ironically as my hair is now dark brown). Sorry if it came across as hairist, I didn't mean it to sound that way! 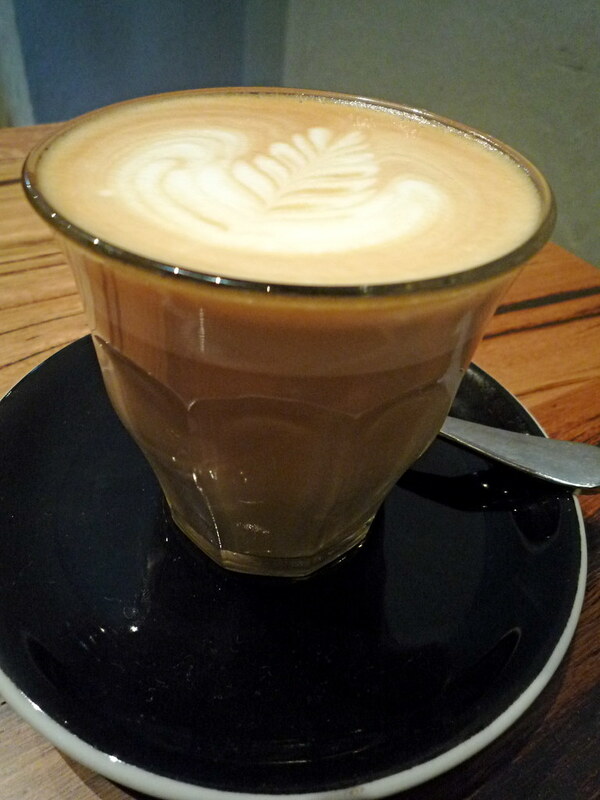 Flat White is the *only* place to get decent coffee in London. 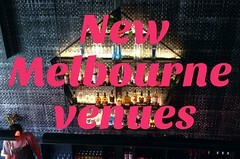 It's run by some adorable Kiwis, and the cafe lattes there are called "Melbourne lattes". I was told that this is because they serve them in tumblers, which is the style a la Melbourne, and apparently is idiosyncratic to our neck of the woods. I don't believe them. I even have a Flat White loyalty card in my wallet for next time I'm over there! Tried Crue Coffee Lounge today on your recommendation and it was delicious - thank you! I had the BLAT (bacon, lettuce, avocado/aoili, tomato), which was just perfect, and my companion had the zucchini fritters with salmon and loved them. The coffee was delicious but a touch cold for my liking. Good service there too we found. 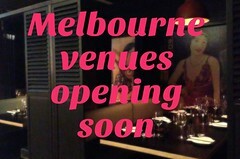 I'll definitely go back again, the rest of the menu looks great.